The AdderView CATx Series AVX4016IP is a 16 port secure, KVM via CATx switch that provides 4 concurrent users (1x local PS/2 or USB, 2 x remote over CATx, 1 x global over IP) with BIOS-level control of up to 16 multiplatform servers. A "plug-and-play",1U appliance, the AdderView AVX4016IP is a completely self-contained system that installs in minutes combining high security, flexibility, integrated remote power control, faultless quality video and optional CD quality audio. The AdderView AVX4016IP can be controlled by two users from up to 985ft (300m) away over CATx cable using the AdderLink X200 or X100 receiver and the integrated CATx extender. One local user, two extended, and/or four extended remote user can control up to 16 multi-platform servers simultaneously. Up to 16 different user profiles can be stored with access rights for each user defined. AdderView CATx IP 4000 provides exceptionally high video performance to local, remote and global users alike, supporting up to 1900x1440 resolutions (1600x1200 on remote and IP links) with DDC emulation which is further enhanced by DC balancing to ensure full and true color. Flash upgradeable CAMs are available for VGA and DisplayPort video + PS/2, USB and Sun keyboard and mouse support with optional audio. KVM communication from switch to target devices can be up to 50m (164ft). AdderView CATx IP 4000 switches support CD quality 44.1kHz digital stereo audio when optional audio enabled CAM modules are used. The AdderView AVX4016IP can be switched using selectable keyboard hotkeys, an on-screen-display (OSD), 3 button mice, or with ASCII codes via serial RS233. These switching options allow you to rapidly reassign connected devices to any of the connected computers. For mission critical applications, CatX IP 4000 series now supports dual power inlets (Dual-AC). If one source fails, the AVX4016IP will switch sources to the other power supply, so as not to interrupt normal use of the connected servers. 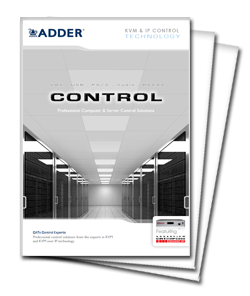 The AdderView CATx IP 4000 switches support any computer platforms with PS/2, USB and Sun keyboard and mouse interfaces. Country code reporting, DDC and continuous keyboard and mouse emulation ensure faultless operation. Expand simply by using just CATx cable to link units. 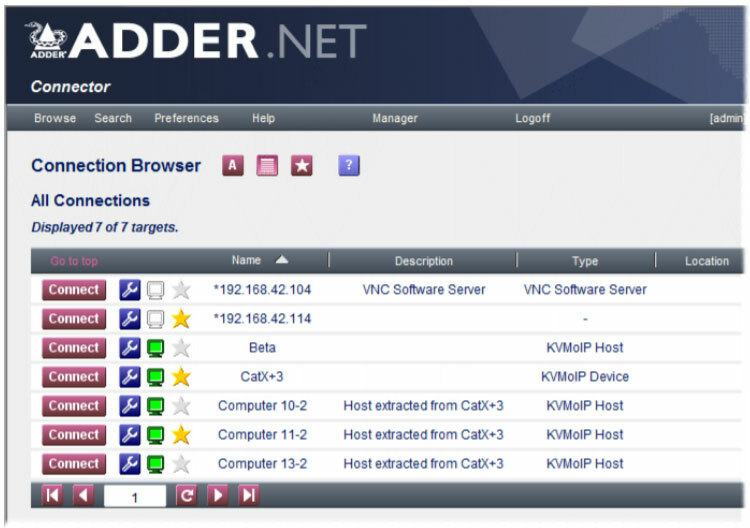 The AdderView automatically detects cascade connections to support up to 128 computers. CATx IP 4000 switches can be mounted in 1U of rack height giving a maximum of 16 ports per 1U (rack brackets included). Small size also makes the units ideal for mounting behind KVM rack drawers. One extender required per remote user. X200 units are similar to X100 except that they can accommodate a second link to another switch or computer. X200 units also have USB connections rather than PS/2-style keyboard and mouse ports. Three different variants are available for each X100 or X200 unit - AS/R variants have audio and video skew circuitry to overcome extreme video degradation problems. A/R variants lack the skew circuitry and R variants do not have skew circuitry or audio. Each module is supplied with its own power adapter and country-specific power lead. Hardware compatibility Supports PC, Sun (USB & 8-pin styles), Mac (USB), RS/6000, Alpha and SGI computers using PS/2, USB or Sun computer interface modules. AVX4016IP is also known as the AVX4016IP-US and AVX4016IP-USA.